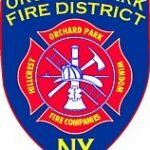 Orchard Park, Windom, & Hillcrest Firefighters responded on 7/4/17 at 2207 Hrs for a report of a structure fire at Woodland Dr & Hillside Dr.
Police were on location reporting a fully involved structure fire. Orchard Park 9-2 went on location reporting the #1 side fully involved and extending to the rear of a 1 story house. Command reported a victim with smoke inhalation and burns and requested EMS to the scene. Woodlawn, Hamburg, & Newton Abbott (FAST) responded as mutual aid to the scene. East Aurora filled in at Orchard Park Central. The fire was reported knocked down in 25 minutes.